So much yarn, so little time. 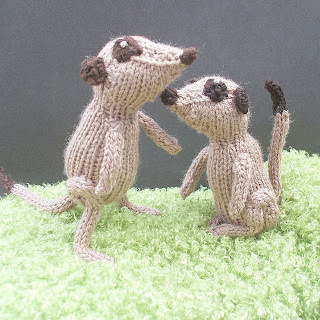 : The meercats have arrived! 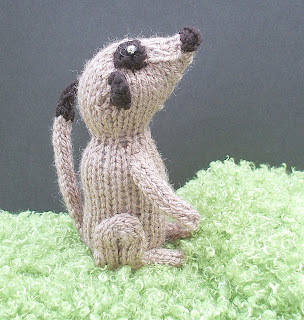 I challenged myself a while back to make some meercats - and yesterday was the day I finally settled down to the task. 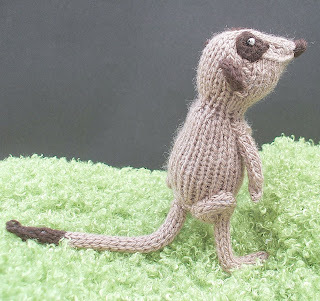 It took several attempts before I had got the shape of the head to my liking, and I had to have a break to watch a rerun of Meercat Manor for inspiration. Here's my first meercat, obviously a juvenile who hasn't quite worked out how to stand up tall on sentry duty. I slept on his problem - and when I awoke I'd sussed how to help him. Meercat (or is it meerKat?) number two has much stronger back legs and tail owing to their pipecleaner "bones", so he can stand in the traditional "tripod" stance. Aww, these turned out so cute! I love them! So cute and real looking, they should be in the childrens' Zoo in the Bronx Zoo! I've knitted 5 now - quite a mob! I googled, MOB is the collective noun, apparently. Doesn't sound cute enough to me!